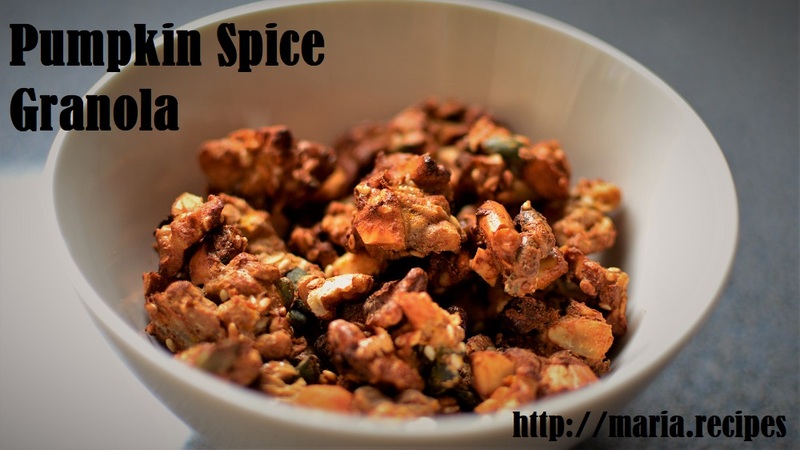 This is my favorite breakfast lately: a granola made with nuts and seeds, with pumpkin spice. So delicious with some greek yogurt or almond milk, or on its own as a snack! This granola is not very sweet as I usually add some stevia to the yogurt, but you can always increase the erythritol or add in some stevia to make it sweeter. If you like my recipes, don’t forget to subscribe, which will also give you access to the Keto Recipe Recommender. Warm up the oven to 200C. Mix all the nuts and seeds in a bowl. Blend the eggs with the pumpkin, erythritol, salt, coconut flour and spices. Pour the blend over the nut-seed bowl, mix everything. Transfer into big chunks onto an anti-adherent baking pan. Bake for 7 minutes, take it out and mix well, breaking up any pieces that may be too big. Bake for another 5 minutes. Take it out, mix it again to avoid any areas burning. Bake for another 3-8 minutes depending on how roasted you want it.